The Michelin Star Award winners Marc Fosh and P. Arellano, chef of the restaurant Zaranda, formed an alliance in order to conduct Fosh & Friends, an intimate event where several jointly cooked dishes were presented. 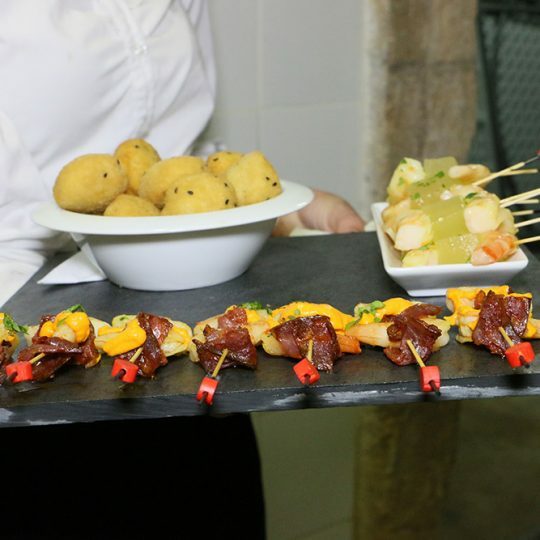 This presentation took place in Simply Fosh, and it was carried out in a warm and personal atmosphere, where the attendees could enjoy the cooking results of both chefs cooperation. Undoubtedly, a unique chance and an absolute privilege for the senses. According to Arellano, both himself and Marc Fosh share similar ways of proceeding and the same way of understanding cooking. They have the same roots but still keeping their own personal style. Initially, both cooks’ idea was to prepare their own specialities separately. However, they realised that it would be more interesting if they made something unique for that event, and so came the idea of dish fusion. Among the offered dishes for this event, we highlight the marinated ox bonbons with caramelised onion cream accompanied with eel salad, or an exquisite hunting meat triptych selection, including deer with beetroot and coffee sauce, stewed hare bonbon stuffed with foie and partridge consommé with ravioli. Undoubtedly, an absolute luxury for the most discerning palates.